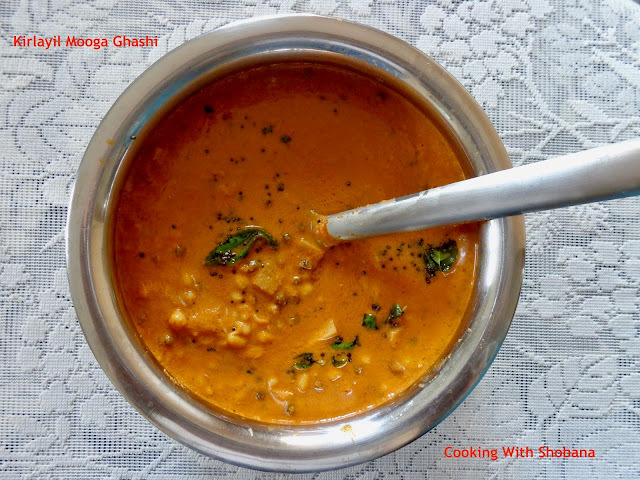 I have used this blog to share, amongst others, recipes from our Konkani speaking GSB community. 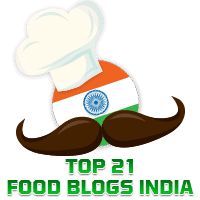 Elsewhere in this blog , you will find recipes therefore for our popular dishes such as Soyi Bajjile Ghashi, Peas and Potatoes Ambat, and Ghosale Alle Piyava Ghashi. Today's dish is a "Ghashi'" which is a mildly-spiced coconut-based curry of lentils. Generally, in making a ghashi, the lentils are paired with yam, potato, raw jackfruit or tender bamboo shoots. In today's recipe, we use Sprouted Green Gram which we call "Kirlayil Moog" in Konkani and Tender Bamboo Shoots ( called Kirlu) which we consider a delicacy. 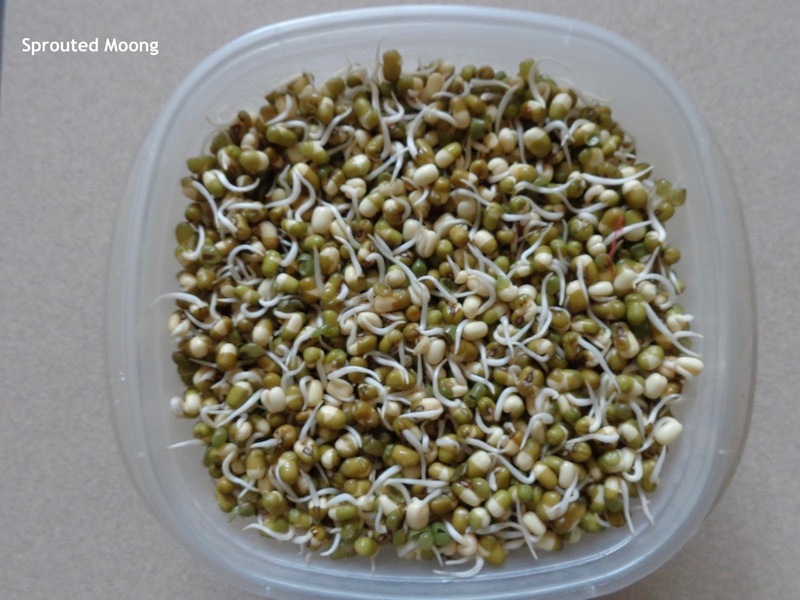 To start with we need to sprout the green gram (moong). You will know that sprouting the moong adds to it's nutritive value and also makes it more easily digestible. Wash and soak the green gram for 8-10 hours or overnight. 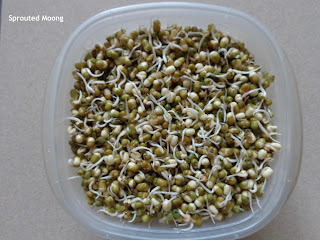 Drain the water fully the next day and tie the moong beans in a wet muslin cloth and allow them to sprout. The sprouted moong is shown in the picture along with the list of Ingredients. In my experience, about 1 cup of soaked moong will yield about 3 to 3 and 1/2 cups of Sprouted Moong. Wash the sprouted moong thoroughly till it is de-skinned yet retains the sprouts. Cook the sprouted moong in a pan with adequate water until it gets done. Take care that it does not get overcooked or mushy. Keep aside. Wash the brined bamboo shoots in several changes of water to get rid of the excess salt. Dice the bamboo shoots and cook it in adequate water in the pressure cooker for 1-2 whistles or till they became tender. When the cooker cools, remove the cooked bamboo shoots and keep aside. In a mixer, grind together the coconut gratings, roasted red chillies, tamarind, and raw rice to a smooth paste adding the required amount of water. Keep aside. Mix well and add water, if required, to get a ghashi-like consistency. The ghashi should not be too thick or too watery.